Order any of our Ultrasmall Reagents and receive a $25 gift certificate which may be used towards the purchase of any of our EMS line of products. The table below lists a few physical characteristics of gold conjugates. AURION Conventional Immunogold Reagents are tailored to contain 10-20 µg of specific protein/ml. The reagents are supplied in PBS with 1% Bovine Serum Albumin and 15 mM NaN3 at an OD520nm of 1.0 to warrant prolonged cluster free storage. 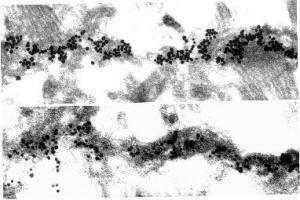 The activity of each lot is determined using a dot-spot test system as described by Moeremans et al., J. Immunol. Methods, 74, (1984), 353. Actual lot specifications (size, variation and expiry date) are indicated on the accompanying package insert. Aurion offers the widest range of Conventional Immunogold Reagents. To view the complete list of available reagents click here. Aurion Ultra Small Immunogold Reagents are prepared with subnanometer gold particles. These particles have far less influence on the adsorbed antibodies or detecting molecules, and consequently the conjugates behave as though they are uncoupled. 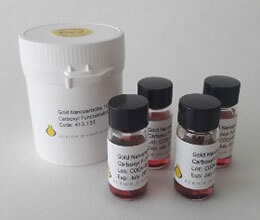 In conjunction with the highly efficient and easy-to-use R-Gent SE-LM and SE-EM silver enhancement reagents, the Ultra Small Immunogold Reagents are the best choice for any application. 0.8 nm 15 3·103 5·1015 0.1-1? The small gold particles also have a tight particle surface curvature which makes it less likely that a structured water dipole layer will build-up around the gold particles. Hence, the hydrodynamic radius of the ultra small gold colloids is reduced. Finally, small gold particles carry less net negative charge; thus, they undergo less charge determined repulsion when approaching the sample surface. Aurion offers Ultra Small Immunogold Reagents with an average gold particle diameter of 0.8 nm or less. These ultra small gold particles can be visualized directly in high angle annular dark-field-scanning TEM. However, the gold signal is normally visualized after increasing the particle diameter with silver enhancement. The reagents can be used in electron and light microscopy as well as in blotting experiments. The universal applicability makes it easy to compare results obtained with different procedures. AURION Ultra Small Immunogold Reagents contain 60-80 µg of specific protein/ml for IgG conjugates. F(ab')2, Fab and biotinylated albumin conjugates contain equimolar amounts of conjugated protein. The average gold cluster diameter is less than 0.8 nm. AURION Ultra Small Immunogold Reagents are used in conjunction with AURION R-Gent SE-EM or SE-LM silver enhancement reagents, developed for electron microscopy and light microscopy/immunoblotting respectively. The reagents are supplied in PBS with 1% Bovine Serum Albumin and 15 mM NaN3. The activity of each lot is determined using a dot-spot test system as described by Moeremans et al., J. Immunol. Methods, 74, (1984), 353. Small package: for 480 grids or 240 slides. Aurion offers the widest range of Ultra Small Immunogold Reagents. The most commonly used reagent types are available as intact IgG, F(ab')2 and Single Fab conjugates. To view the complete list of available reagents click here. AURION Ultra Small Immunogold Reagents are prepared using the highest quality antibodies or binding agents available. All antibodies are immuno affinity purified and immuno cross-adsorbed to reduce non-specific interactions. AURION Immunogold Reagents have a guaranteed shelf life of 18 months from the date of quality control analysis. Aurion has developed Blocking Solutions which effectively block 'sticky' surfaces by multi-point hydrophobic and charge-based interactions. The Blocking Solutions are specifically designed to meet the characteristics of each type of secondary conjugate. The AURION Blocking Solutions are used to prevent immunoreagents from binding non-specifically to specimens with "sticky" surface properties. These steps should be balanced for optimum results. serum-free: for use with Protein A and Protein G Gold conjugates. with Normal Goat serum: for use with reagents based on secondary antibodies raised in Goat. with Normal Rabbit serum: for use with reagents based on secondary antibodies raised in Rabbit. with Normal Sheep serum: for use with reagents based on secondary antibodies raised in Sheep. with Normal Donkey serum: for use with reagents based on secondary antibodies raised in Donkey. AURION Blocking Solutions have a guaranteed shelf life of 18 months from the date of quality control analysis. 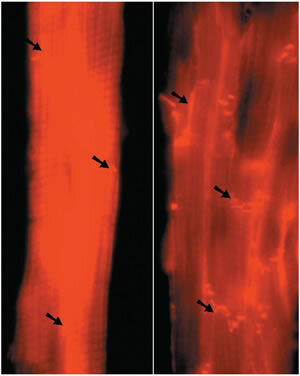 In the blocking step, hydrophobic moieties causing "stickiness" in the specimen surface are rendered hydrophilic to minimize background. 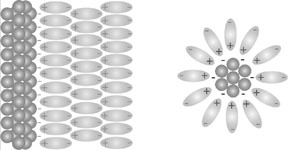 Nevertheless, the more dynamic charge-based interaction between the specimen surface and immunoreagents also needs to be controlled in order to eliminate background. Aurion has developed BSA-c™, a unique incubation buffer additive with an unparalleled ability to effectively prevent charge based background. BSA-c™ is prepared by acetylation of bovine serum albumin (BSA). Polycationic sites in the specimen interact readily with negatively charged acetylated BSA molecules. This significantly reduces the risk that such sites might bind negatively-charged immunoreagents and immunogold conjugates and thus reduces the risk of background. To reduce non-specific binding of immunoreagents caused by hydrophilic interaction with competing molecules in the incubation and washing solution. AURION BSA-c™ is a particularly effective reagent for this purpose. AURION BSA-c™ is a buffer additive that helps prevent immunodetection reagents (i.e. primary antibodies and secondary reagents) from binding nonspecifically to charged moieties within the specimen. Thus, it suppresses background competitively with little or no effect on the specific reaction. Its successful application is not limited to immunogold detections but it is equally efficient in fluorescent and enzyme-based detection systems. AURION BSA-c™ concentrations as low as 0.01-0.1% inhibit binding of gold conjugate to polycationic poly-l-lysine coated grids almost completely (>99%). + positively charged (histone proteins, polycations) and H hydrophobic (lipids, fat droplets, resins). After an appropriate blocking step these areas are covered with blocking compounds. In low ionic strength media negatively charged antibodies and gold conjugates are repulsed by negatively charged specimen areas which frequently may contain the antigens to be detected. Background does not likely occur in such areas. The positively charged areas attract antibodies and gold conjugates potentially leading to background. In a moderate ionic strength incubation solution, repulsion and attraction are diminished due to the presence of ions. The negatively charged BSA-c™ competes with the negatively charged antibodies and gold reagents for non-specific binding to the positively charged specimen compounds, thus reducing background to the greatest possible extent without interfering with antigen detection. AURION BSA-c™ concentrated solution contains acetylated bovine serum albumin as the functional constituent. By acetylation of amines on basic amino acids these groups are no longer as easily protonated and the isoelectric point of such molecules is lowered and hydrophobicity is increased. BSA-c™ is a 10% solution of acetylated BSA at slightly alkaline pH with Kathon CG as preservative. The bovine serum albumin that Aurion uses to prepare BSA-c™ is obtained from healthy livestock. The charge dependent background inhibition capacity of the BSA-c™ in each lot is determined using a dot-spot test system with polycationic compounds. AURION BSA-c™ concentrate has a guaranteed shelf life of 18 months from the date of quality control analysis. The products should be stored at 4-8°C. Freezing is not recommended. The ready-to-use Blocking Solutions and the incubation media additive BSA-c™ are tuned for optimum background prevention and signal-to-noise ratio. In-depth information can be found in the respective product data sheets. AURION also offers a number of components that allow researchers to formulate blocking, incubation and wash solutions according to the needs of their own experiments. Aurion's Bovine Serum Albumin is obtained from healthy livestock. BSA should be dissolved in an appropriate buffer, such as phosphate buffered saline, taking care not to denature the protein by foaming. The addition of BSA may cause a drop in pH of the final solution and correction may be required. As a preservative the use of NaN­3 or Kathon CG is recommended. The use of Cold Water Fish Skin Gelatin to prevent background reactions has been recommended by e.g. Behnke et al. (J. Cell Biol. 41, , 386). The product is supplied as a liquid concentrate (40%). Tween-20™ is a non-ionic detergent with a molecular weight of about 600 and a critical micelle concentration (CMC) of 0.06-0.07% in water at room temperature. Its working mechanism may in part be based on its action as a detergent, binding to the hydrophobic moieties of water insoluble compounds, rendering them hydrophilic. In addition, immuno-compounds may become incorporated into micelles when the Tween-20™ concentration is higher than the CMC, for instance at 0.1 % in PBS at pH 7.4. Normal sera are used to counteract the non-specific interaction between the sample and immunoglobulins. They can be added to the blocking solution and the incubation media. As a rule the normal serum species should be the same as the secondary antibody species (e.g. use normal goat serum with goat-anti-rabbit conjugates). Note: normal sera should not be used in combination with Protein A and Protein G gold reagents. 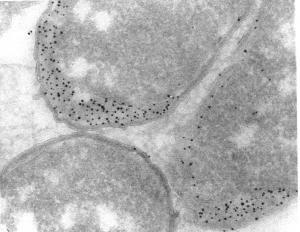 For most applications the detection of ultra small gold particles in electron microscopy requires a particle enhancement procedure. Danscher's method has always been the standard for this purpose and for a long time attempts to improve the features of Danscher's system met with only limited success. The goal in the development of AURION R-Gent SE-EM was to create a new system with enhancement efficiency and homogeneity at least comparable to Danscher's method, but with reduced acidity and light sensitivity. In addition, the reagents should have low viscosity for the suitability in pre-embedding immunogold labeling. The silver enhancement reaction is a gold particle-catalyzed reduction in which silver ions are reduced to metallic silver with a photographic developing compound as the electron source. In addition in many applications a "protective colloid" is added to the enhancement solution to limit diffusion of reagents to the gold particle surface, thus providing a means for controlling particle growth. "...silver enhancement reaction is a gold particle-catalyzed reduction in which silver ions are reduced to metallic silver with a photographic developing compound as the electron source.."
Desmin labeling in heart muscle with Ultra Small Gold conjugate and AURION R-Gent SE-EM. Courtesy Prof. Dr. Müller Höcker, University Munich, FRG. AURION R-Gent SE-EM has been tested ntensively for the enhancement of AURION Ultra Small Immunogold reagents. a 3 ml empty dropping bottle, labeled "DEVELOPER". The INITIATOR is a concentrated solution which must be diluted and activated before use, using the ACTIVATOR. This resulting mixture is the DEVELOPER. The now ready-to-use DEVELOPER has a shelf life of one month. It is suggested to prepare fresh DEVELOPER at least every month. For enhancement one drop of DEVELOPER is mixed with 20 drops of ENHANCER. The typical enhancement time is between 20 and 40 minutes. Specimens may be contrasted according to standard procedures. The AURION R-Gent SE-EM components are stored at 4°C and allowed to reach room temperature before use. SE-EM INITIATOR may be stored at -20°C for prolonged shelf life. The silver enhancement reaction is based on the gold particle catalyzed reduction of Ag+ to metallic silver using photographic developing compounds as the electron source. For light microscopy and immunoblotting applications the generated silver signal should be of high contrast. Furthermore the signal should be permanent and compatible with counterstaining. Light microscopy evaluation of tubulin labeling with Ultra Small Immunogold Reagents and silver enhancement. The AURION R-GENT SE-LM components constitute a Silver Enhancement Reagent which increases the average gold cluster or particle size by deposition of metallic silver facilitating detection at the light microscopical level. The generated brown-black signal is also easily detected in bio assays and is compatible with counterstaining in light microscopy. AURION R-GENT SE-LM has been tailored for the enhancement of AURION Ultra Small Immunogold reagents and is equally suited for the larger sized particles in the AURION Conventional Immunogold reagents. For enhancement, equal amounts of the DEVELOPER and ENHANCER are mixed well and applied to the specimen. The enhancement mixture is easy-to-use, exhibits extremely delayed auto-nucleation and can be used under standard laboratory light conditions. Typical enhancement times are between 15 and 30 minutes. Auto-nucleation becomes visible only after 40-60 minutes. Light microscopical specimens may be counterstained according to standard procedures. The enhancement mixture has a pH value of 8.3-8.5. AURION R-GENT SE-LM is available as a kit in two unit sizes (2 x 30 ml or 2 x 250 ml) and consists of a separate DEVELOPER and ENHANCER. The supplied amounts accomodate 600 and 5000 LM specimens respectively at 100 µl/specimen, or 60 and 500 bio assay specimens at 1 ml/specimen. The reactivity is tested on dot-spots and the absence of autonucleation is monitored by spectrophotometric techniques. The AURION R-GENT SE-LM components are stored at 4°C and allowed to reach room temperature before use. The negative surface charge of colloidal gold particles is responsible for their high affinity for positively charged macromolecules. This characteristic was the basis for the development of a total protein stain based on colloidal gold. Col-Aurion is a total protein stain consisting of a solution of coated gold particles with an average particle diameter of 15 nm. The staining principle is based on the electrostatic binding of negatively charged gold particles to proteins with a positive charge present at low pH. A unique feature of Col-Aurion is the use of BSA-c™ to shield off the surface of the gold particles. Destabilization of gold particles that might occur as a result of interaction with detached protein is thus prevented. The strong negative charge of BSA-c™ gives an additional increase in sensitivity of the stain. Col-Aurion total protein stain has a pH of 3.2 and is ready to use. For removal of surplus of weakly bound protein from the membrane, a 10 ml vial of Tween-20™ is included. Col-Aurion has a guaranteed shelf life of 18 months from the date of quality control analysis. Store at 4-8°C. Do not freeze. The Aurion gold sols are prepared according to unique production protocols. This provides for sol particles with the same narrow size distribution and adsorption properties as employed in the Conventional Immunogold Reagents. Aurion Gold Sols (solutions of high quality unconjugated gold particles) provide opportunities for users to prepare conjugates with primary antibodies, ligands and other binding agents with the same particle characteristics as in the Conventional Immunogold Reagents. AURION Gold Sols are prepared according to a unique protocol, warranting narrow size distribution and reproducible adsorption characteristics. The AURION gold sols are available in the same size range as the Conventional Immunogold Reagents: 6, 10, 15 and 25 nm. The particle population is monodisperse and thus shows minimal size variation and overlap. Typically, the coefficient of variance for the 6 and 25 nm particle size sols is less than 12%, whereas the 10 and 15 nm size sols show less then 10% variation. Actual lot specifications (size, variation and expiry date) are indicated on the accompanying package insert. AURION gold sols have a guaranteed shelf life of 12 months from the date of quality control analysis. We are proud to announce the introduction of a series of Carboxyl-functionalized Gold Nanoparticles. This product has been developed to facilitate conjugating gold nanoparticles to molecules that cannot be conjugated via the classic direct adsorption method. The product is especially suited for covalent conjugation of small ligands. Aurion Gold Nanoparticles (Carboxyl Functionalized) are polyethylene glycol-carboxyl stabilized gold nanoparticle solutions based on defined particle sizes of 6, 10, 15 and 25nm. They are prepared using in-house developed production protocols giving the product a narrow size distribution, long term stability and optimal conjugation properties. Biomolecules having primary amines available can be covalently conjugated using EDC/sulfo-NHS chemistry. 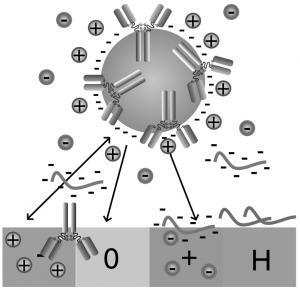 Biomolecules that are too small to be conjugated to Gold Nanoparticles via adsorption can be covalently linked to Carboxyl-functionalized Gold Nanoparticles. Primary amines are present in e.g. the N-terminal side of peptides and in the side group of the amino acid lysine. The conjugation relies on well known and proven EDC/sulfo-NHS chemistry. EDC (N-(3-Dimethylaminopropyl)-N'-ethylcarbodiimide hydrochloride) is a water soluble carbodiimide which transforms the carboxyl groups on the gold to an active ester in the presence of sulfo-NHS (N-Hydroxy-sulfosucciimide, sodium salt). These sulfo-NHS esters are relatively stable in acidic environment and couple rapidly to the amine(s) in the target molecules. Aurion Gold Nanoparticles (Carboxyl Functionalized) are prepared according to a unique protocol, warranting narrow size distribution, long term stability and optimal conjugation properties. They are available in size ranges 6, 10, 15 and 25 nm. The particle population is monodisperse and thus shows minimal size variation and overlap. Typically, the coefficient of variance for the 6 and 25 nm particle size sols is less than 12%, whereas the 10 and 15 nm size sols show less then 10% variation. Actual lot specifications (size, variation and expiry date) are indicated on the accompanying package insert. Aurion Gold Nanoparticles (Carboxyl Functionalized) are supplied in 10mM MES buffer, pH 5.0. Package size: 4x5 ml of high quality Carboxyl-functionalized Gold Nanoparticles at an OD520nm = 1.0. Aurion Gold Nanoparticles (Carboxyl Functionalized) have a guaranteed shelf life of 12 months from the date of quality control analysis. Aurion Gold Tracers are used to visualize charged moieties in specimens: anionic tracers bind to polycationic moieties (basic proteins e.g. histones, cationic tracers bind to polyanionic moieties (membranes, acidic proteins). "Neutral" BSA coated gold tracers are useful for detecting open connections and tissue damage. 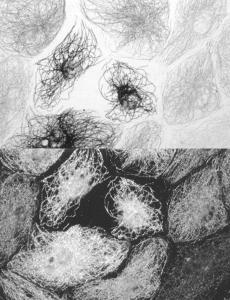 Under proper conditions and with suitable microscopical techniques the tracers can also be used to follow cellular events in time. The AURION Anionic and Cationic Gold Tracers are designed to detect charged areas; the anionic tracers detecting multiple positive charge moieties, the cationic tracers detecting multiple negative charges. The AURION Gold Tracers are available in the full range of particle sizes: Ultra Small, 6, 10, 15 and 25 nm. Anionic Gold Tracers are prepared with BSA-c™ as particle conjugated protein. Cationic Gold Tracers are prepared with methylated BSA. AURION Gold Tracers are available in 5 and 10 ml volume packages and are supplied at an OD520nm of 2.0 for the conventional particle size range and at equivalent OD for the Ultra Small tracers. The products are supplied in PBS, with 15 mM NaN3. AURION Gold Tracers are also available in bulk and at different optical density if required. AURION Gold Tracers are shipped containing NaN3 as preservative. If they are intended for use in living organisms, the preservative has to be removed prior to use. This can be achieved either by dialysis or by buffer exchange using for instance a Pharmacia PD-10 column. Aurion gold tracers have a guaranteed shelf life of 18 months from the date of quality control analysis.